Finding out designs for various apps may be easy - but if ti comes to a design which is not only historic but is also WW-II vintage, one has to pay a big amount - a really big amount. And this is what exactly Apple did for its iOS 6 clock design. It is reported by French news agency AFP, citing a Swiss paper, that Apple has paid $21 million for the Swiss Clock which is installed on the building of the Swiss Federal Railway Service. 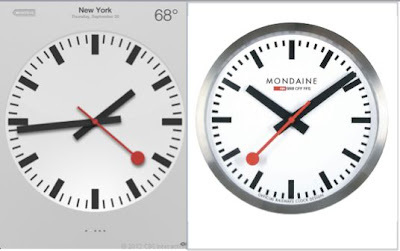 Initially, the Swiss railway service, known as SBB, objected to the clock-face design in iOS 6, saying it too closely resembled a trademarked design created in 1944 by SBB employee Hans Hilfiker and used in train stations throughout Switzerland.